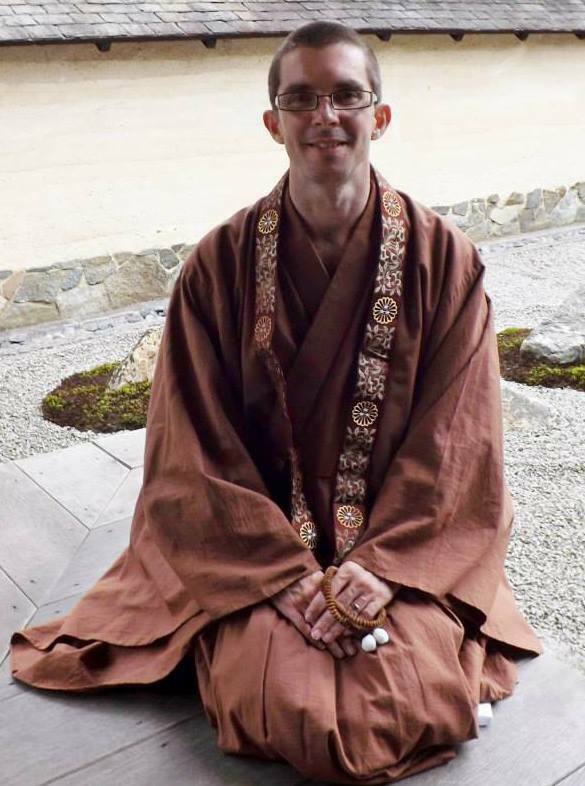 Seishin began his journey into Buddhism whilst at college, where he gained an interest into world religions. Having read into various religions and spiritualties’, he became interested in Buddhist meditation whilst practicing martial arts at university. Joining various Buddhist groups whilst at Uni and after graduating, he found none really satisfied him. In the summer of 2008, he got in contact with Rev Ganshin who welcomed him to the group. Having found a home with Tendai and with Ganshin, Seishin decided to ordain. After much preparation, Seishin received Shukke Tokudo (formal ordination) from Ganshin, with the blessings of Rev Prof Ichishima, on the 31st July 2013. Sadly, Ganshin passed away on 1st September 2014, aged 88. As requested and now under the tutelage of Rev Prof Ichishima, Seishin leads the UK services and meditations. Seishin is a member of Hampshire SACRE (Standing Advisory Council on Religious Education) as a faith representative to bring Buddhism to schools across Hampshire. He has also become a consultant for the BDK to carry out the work Rev Ganshin started, distributing Buddhist books to schools, hospitals and hotels across the UK.